Here's how we have impacted the Earth the last four years! At the time, Frankie was the standing Families in Transition Support Coordinator for the Lucia Mar School District. She worked with the 1,335 homeless students in the district to supply them with the necessary hygiene products and school supplies that they lacked. Our first year donors were asked to either buy specific supplies from a Target.com registry, or donate funds for Frankie to purchase the supplies herself. We collected hundreds of school supplies and hygiene products that Frankie then distributed to her students. What a fantastic start to the campaign! Frankie had worked closely with San Luis Obispo County Social Services during her time as the FIT Support Coordinator. As such, a wonderful case worker was able to connect Frankie with a family who had lost everything when their house burned to the ground. Our donors raised $688 to help the family get back on their feet. 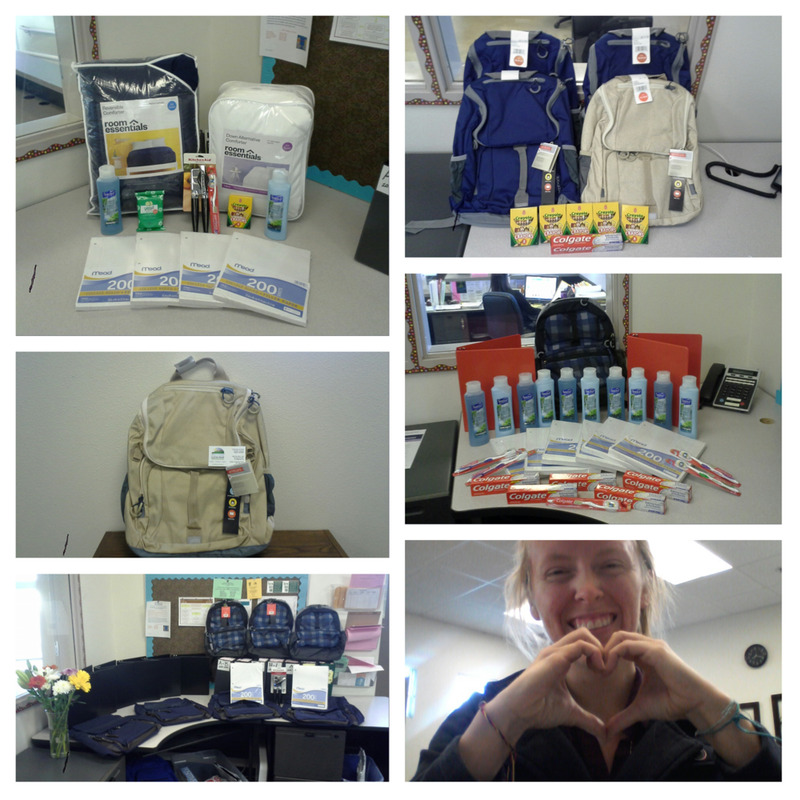 With these funds Frankie hand-purchased and delivered items that would sustainably help the family. Such items included a $200 gift card for clothes, new bedding, and a device to help their autistic daughter communicate. This family is forever touched by your generosity! The start of 2017 was a devastating time for the people of Northern Perú. After months of intense flooding and storms, many people had perished, and even more had lost their homes. Frankie was personally touched by the disaster after a friend she had made in Piura, Perú passed away in a related accident. To honor her lovely friend Lorena, as well as the country she considers her second home, Frankie partnered with local AIESEC member and friend Aru Moscol Oliva. The two agreed on a list of the most-needed items for survivors in the affected towns near Aru's home of Catacaos. Donors broke our previous record by donating $1,210.44! With these funds, Aru was able to purchase and deliver hundreds of disaster relief items, such as mattresses, food, and school supplies. We stand united with you, Perú! Amelia's* story is truly remarkable. In 2015, in the midst of the war-torn African country of the Congo, Amelia was violently attacked by her abusive husband's family. They managed to break her leg to the point of needing internal metal supports to hold the leg together. In 2016, she was ripped from her home by soldiers as her village burned to the ground. Two of her children managed to escape with her, while she was forced to leave her other three children behind. It has been two years, and she still does not know what became of her missing children. That is when she fled her country with her husband and two remaining children. They were granted asylum in the United States, where they are now registered refugees. But the horrors of Amelia's story do not end there. Her husband continued to violently abuse her. In an act of incredible strength, Amelia took the children and escaped her abuser, all while being 9 months pregnant. They lived in a battered women's shelter until she was able to find housing in the Summer of 2017. In an incredible turn of events, Amelia and her three children are now living a stable life away from their abuser. Amelia is currently working with resources in her community to help her pursue a brighter future for her and her children. Additionally, Amelia is receiving disability and food stamps from the state, which continues to be enough to sustain the family in a low-income-housing apartment. Amelia hopes to be able to work in the future if the condition of her leg improves enough to allow her to stand for long periods of time. The family was very grateful for your support, especially the young daughter, who couldn’t stop smiling while we were there. Once again, our incredible donors broke our previous record by donating $3,536.89!!! We were able to provide the family with brand new beds and bedding, a Dell laptop for homework, new clothes and shoes, a kitchen table and chairs, a full set of pots, pans, dishes, and silverware, brand-new bikes and helmets, and 1 year’s worth of bus passes to help them get around town! Check out the Updates tab for a more in depth review of what was given to the family.